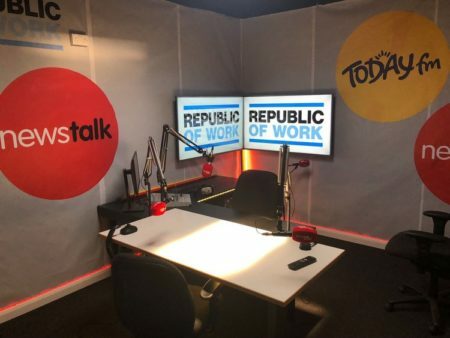 Newstalk and Today FM have announced the launch of a new broadcast studio at ‘Republic of Work’ which is a shared building hosting offices and breakout areas for modern businesses. The three-year partnership with Republic of Work will see both national stations broadcast regularly from the purpose-built facility at 12 South Mall in the heart of Cork City. Newstalk’s Ciara Kelly will host her first lunchtime show from the Cork studio today, while Today FM’s Matt Cooper will present The Last Word live from the new Cork studio before attending the launch of the new facility to the local business community. Today FM CEO Keith McCormack commented: “Today FM has always enjoyed a great relationship with our Cork audience and this new partnership with Republic of Work will allow us to super serve our listeners in Cork and the greater Munster region. It also gives us the opportunity to take our presenters and shows out of the studio and engage with our audience in a live setting. We’re looking forward to making Cork a home from home for Today FM”.